Just curioius if anyone has seen a reduction in throughput from last night. Used to get around 34mb, now getting around 18mb. 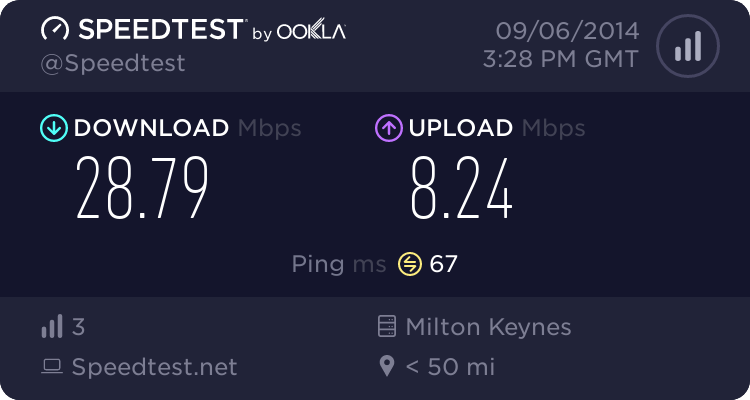 I did keep a record via a ticket but they now appear to be very consistent (between 20 to 35mb) for which is to be expected for a fibre product . It's not just a case of recording speed data for the sake of it. Like I say to customers myself in the faults team at Plusnet. 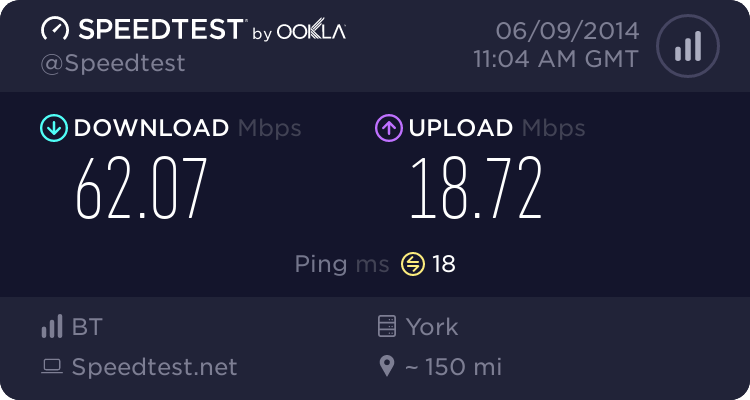 Sometimes just because you see a speed issue, its not the real issue at hand. It could be a dropping connection. Also you have to factor wireless, wired results, other devices using bandwidth, trace routes, etc. If you go to a guideline of between 15 and 40mb on DR and expect fluctuating speeds, you won't go far wrong. Yes you may have been seeing low throughput, but how do you know if your service wasn't degraded heavily during that period due to drops on the DSL link to your cabinet?. The problem with the fibre product at the moment (and this applies to both Digital Region and BT Wholesale) is that they don't offer the customer the utilities to check this themselves and the modem's are totally locked down so you will never know if that is the case. Not that I don't believe you on this one, but how do you know the physical VDSL is dropping?. Unless you are physically up 24/7 you can't say for certain. All you see in router stats is the connection to the RAS itself. You could have sometimes what is known as a "stale session" where the RAS thinks you have an active connection and as such shows one. The only people who would know is the NOC team which looks after the network. These chaps are based in Doncaster or possibly RiPWiRE depending if they been given the diagnostic tools from the NOC. Doesn't everyone's throughput drop though in the evenings?. Granted I wouldn't expect radical 5mb throughput from 35mb, but you don't know what could be causing it. Example, how do you know you have not got REIN (interference) on your line in the evenings which causes errors on your line and then massive throughput failure?. You would be surprised at the amount of cases that are out there on that. People such as you and me wouldn't know because on DR we don't have access to the modem. Sometimes I think for good reason too. I have heard on ThinkBroadband somewhere that you can use a Draytek, but then when Openreach firmware roles out to their kit which enhances the FTTC/P services, how does the customer benefit?. Also with the FTTC/P product, Openreach's responsibility ends at the VDSL equipment, so surely for a better customer guarantee its better to use it?. Because I've been officially told by Ripwire it is only my PPPoE that has been dropping and my VDSL has stayed active throughout. Fair enough they may drop slightly due to other users and I don't dispute that and never have, but would you expect your service to drop from 38mb to less than a 2mb service, on some occasions transfers were less than what i expected on dial-up. But since December my speeds have improved during the evening. That's the difference, currently with DR their responsibility ends at the cabinet, so if they can't find issues with anything on their network the customer is left to contact BT themselves to find out if fault on their line or swap their routers. At least with BT and most other ISP's you get that little extra, they would arrange an engineer if they believed a fault was on the line and advise you there may be a charge if one not found.